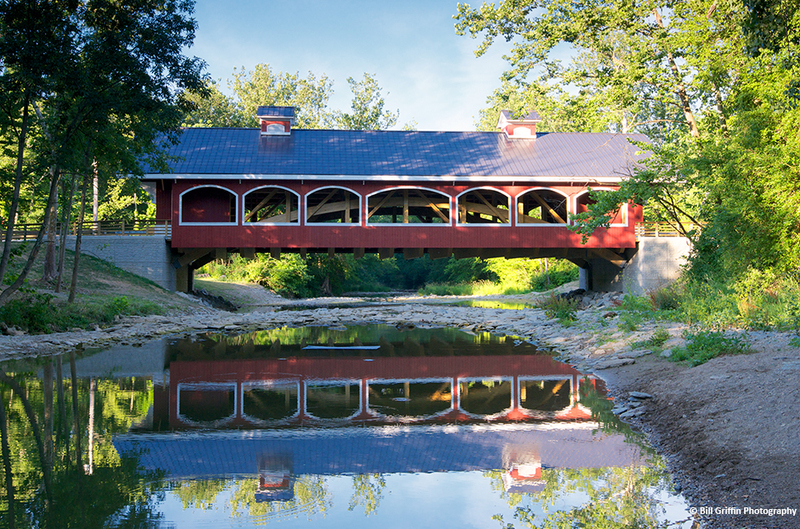 Palmer Engineering teamed with Smolen Engineering to design the replacement structure for this deteriorated truss bridge over Four Mile Creek in Preble County. Extensive redesign of the approach roadway was necessary to meet current design standards. The Palmer design team worked closely with the County to mitigate environmental constraints, coordinate construction schedules, and secure right-of-way and environmental permitting. The replacement structure is a single span Burr Arch Covered Bridge. The superstructure was designed by Smolen Engineering, with all other design components completed by Palmer. Extensive analysis of the behavior of the proposed superstructure (a combination arch and truss bridge) was necessary to ensure that long-term movement of the substructure units would be minimal. With the location of the bridge in Hueston Woods State Park, context sensitive solution (CSS) design and provisions for sidewalks and pedestrian access were included.